Save time comparing and deploying SQL Server database schemas with SQL Compare. 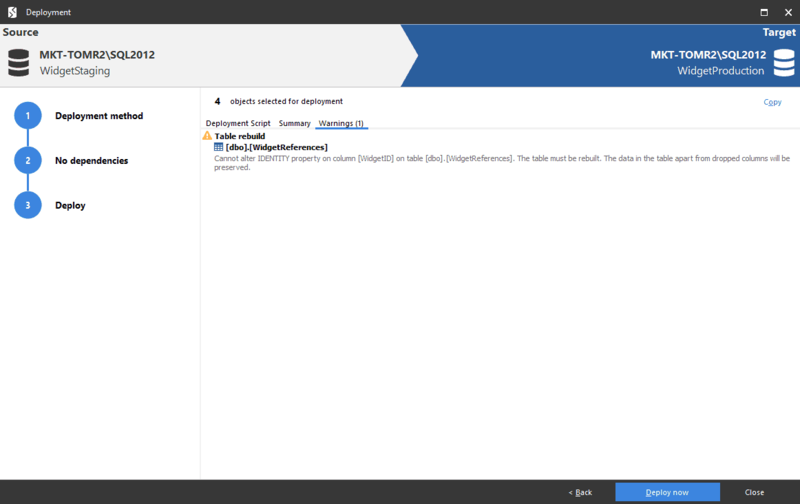 Find and fix errors, and create deployment scripts in minutes. Compare SQL Server database schemas, large or small, and including Temporal Tables, with advanced filtering of database objects. You can explore what’s changed in each database object, down to individual lines of SQL. When you’re ready to deploy, you can create an error-free deployment script in minutes. Troubleshoot database differences and create reports in HTML or Excel. SQL Compare scripts dependencies in your database in the right order, to make sure deployment is successful. You get notifications about any issues, such as data loss, before you deploy. Migrate individual schema differences, a selection of them, or all of them. Build sophisticated rules to selectively limit what to deploy. You can run deployments directly from the UI or command line, save deployment scripts for later use, or automate your deployments using SQL Change Automation. To fix errors in your production database, compare it to a backup, scripts in source control, or a database snapshot. You can deploy single objects to fix the issue fast. If you need to fix static data, use SQL Data Compare to deploy changes without the need for full database recovery. 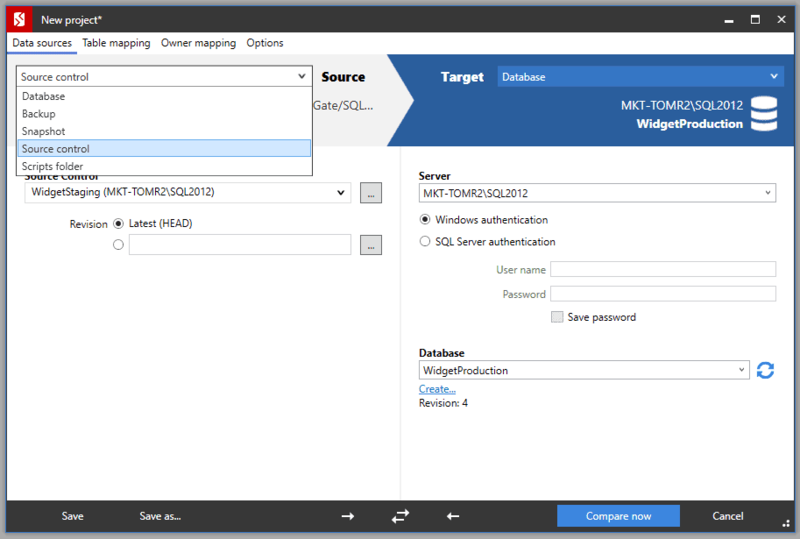 Whether you need to deploy changes or explore the differences between two SQL Server databases, SQL Compare helps you do the job quickly, simply, and with zero errors. “We can create SQL deployment scripts extremely fast and have them ready for a release within minutes of the build being generated. We use SQL Data Compare to sync any system configuration changes, and then we are pretty much ready to go. "We’ve freed up the DBA team by 70-80%. That’s the ROI, and the leadership team can understand that too." Read how Republic Bank streamlined database deployments with SQL Compare, cutting down deployment times from one hour and a quarter to less than 15 minutes and freeing up the DBA team by 70-80%. "The whole of the Redgate family are really reliable tools. It gives you results, you know those results are going to be right." Chris Yates, Serge Krasnay, Lindsay Clark, Arthur Daniels, Nick Fry, and Tjay Belt explain how useful they find SQL Compare every day, why they love and trust SQL Compare, and why they'd recommend it to others. What can I compare, synchronize, and deploy? Download a fully-functional 14-day free trial, and start saving time with your database deployments today.